The cellphone video of a Rolesville, N.C., police officer body-slamming a female high school student to the floor may lead to changes in the way law enforcement operates in the Wake County school system. School administrators are reviewing the district’s agreement with local law-enforcement agencies on school resource officers, and the News & Observer reports that the agreement, which is set to expire in June, says that use of force by officers must be reasonable and not excessive, arbitrary or malicious. 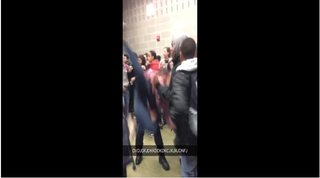 As previously reported on The Root, an eight-second video uploaded to Twitter by a Rolesville High School student shows a group of fellow students at the high school crowded together after a fight when a police officer grabs a girl and slams her to the floor. After throwing her to the floor, the officer picks her up and leads her off with her hands behind her back. The officer, now identified as Ruben De Los Santos, has been placed on administrative leave by the Rolesville Police Department until the investigation into the incident is complete. Rabner told the News & Observer that Jasmine has been to the hospital twice and has follow-up appointments with her primary-care physician as well as both a neurological specialist and a concussion specialist. This latest controversy comes three years after local activists filed a federal civil rights complaint alleging that school resource officers in Wake County use excessive force and treat minority students unfairly. According to the News & Observer, under an agreement approved in 2014, officers are supposed to receive training in areas such as working with students with disabilities and special needs, cultural competency and nondiscriminatory administration of school discipline. Rolesville Police Chief Bobby Langston has asked the State Bureau of Investigation to look into the incident. De Los Santos was wearing a body camera, but police have cited the ongoing investigation as a reason for not releasing the footage taken by the camera. Wake County Sheriff Donnie Harrison has asked that people not make snap judgments based on the short video clip. Pam Akpuda, whose daughter shot and uploaded the original video, said that she wants to talk to Rolesville High School Principal Dhedra Lassiter about the incident.